From the country's earliest days till well after the end of the Civil War, the primary means of communication were personal interaction and the written word delivered by post. Personal interaction required close proximity, as was possible in dense urban districts. Postal service typically provided a poor and often unreliable substitute for face-to-face contact. In 1860, for example, a letter mailed in New York City to be delivered to an address within the city could take from 24 hours to 24 days to reach its destination -- assuming it arrived at all. The telegraph, introduced by Samuel Morse in 1835, provided a rudimentary information system that tied cities together in a national network by means of wires that paralleled railroad tracks. The telegraph's greatest virtue was that it was instantaneous. By the late 1880s the streets of most American cities' commercial districts were a forest of telegraph poles supporting hundreds of telegraph wires connecting major business houses. In the long run, however, the telephone proved to be of much greater significance. First demonstrated in practical form by Alexander Graham Bell at the Philadelphia World's Fair of 1876, the telephone, like the telegraph, provided instantaneous communication. But unlike the telegraph, it could be easily used by any individual and was not limited in the amount and type of information that could readily be transmitted. 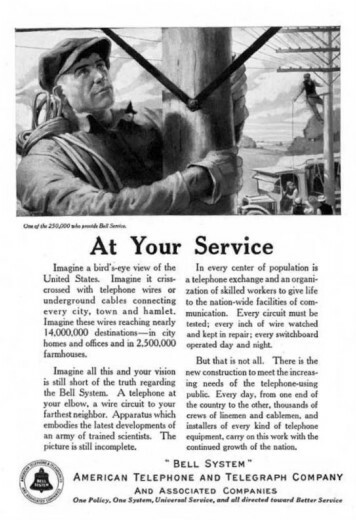 This 1922 Bell System advertisement highlighted the fact that 2,500,000 farmhouses were already wired for phone service. By 1900, 800,000 telephones were in use in America, one for every 95 people -- and usage continued to grow at phenomenal rates. Development of a national integrated telephone system was one of the great accomplishments of the twentieth century. Future historians may well give similar weight to the end-of-the-century explosion in electronic communications ushered in by the Internet. Americans are experiencing a condition of near-universal communication, having access, privately or through a public library, to devices capable of transmitting, receiving, and accessing a vast array of data. For the price of a basic computer and Internet service, one can now access virtually the entire world, instantaneously. Marshall McLuhan's "global village" has become a reality.